Over the past 30 years, childhood obesity rates have more than doubled among children and quadrupled among adolescents, according to the Centers for Disease Control and Prevention. Denise Thomas-Morrow, BS ’85, is determined to do something about that statistic. Her nonprofit, Healthy Moves, is on a mission to create a model of physical education that will lead to healthier, more active kids. In 2010, when First Lady Michelle Obama rolled out her initiative to fight childhood obesity, Thomas-Morrow’s first thought was, “How can we get involved?” She learned that because of budget cuts, many elementary schools in the Eugene-Springfield area no longer have dedicated PE teachers. So, she gathered support from community members and in 2011 started Healthy Moves, an organization that brings certified trainers and volunteers into local elementary schools to work with students and train teachers in physical education, at no cost to the schools. If anyone has the energy and experience to get kids moving, Thomas-Morrow does. At the height of the 1980s fitness craze, she was living in Manhattan and teaching aerobics at some of New York’s hottest fitness centers. Before long, however, she became disillusioned with the mega-gym mentality. “They were just herding them in,” she says. High-impact aerobics were also taking a toll on her physically, and then an injury stopped her in her tracks. “My whole right side literally locked up and was burning,” she remembers. Thomas-Morrow grew up in Eastern Oregon and played basketball, volleyball, and ran track at Baker High School. She attended Oregon College of Education (now Western Oregon University), where she continued playing three sports. She was studying to become a PE teacher when she took an extracurricular dance class. Her teacher, a graduate of the University of Oregon’s masters in dance education program, noticed her ability and suggested she go for a dance degree. The following year, she traded sports for dance, and transferred to the UO. 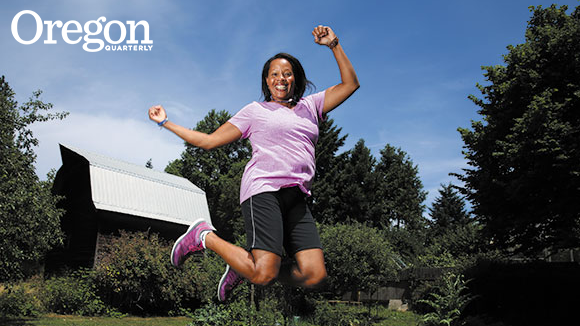 In 1997, Thomas-Morrow returned to Oregon with her husband Randy and rebooted her fitness business out of her home studio in Eugene, where she teaches low-impact aerobics, trampoline, and yoga to small groups, and offers private fitness lessons, chronic pain consultations, and training in the Alexander Technique. She also designs employee health programs, tailored to each work setting. Employees are offered muscle alignment sessions and group exercise classes that focus on the specific muscle groups most used at work. Meanwhile, her nonprofit, Healthy Moves, is growing rapidly, supported by fundraising events, direct donations, and grants, including a $50,000 grant from Nike’s “Designed to Move” program. The organization received $30,000 in 2013 and $100,000 in 2014 from the Oregon Department of Education, which allowed them to serve eight schools last year. Healthy Moves also offers “Jump Start,” a 30-minute before-school exercise program, as well as physical activity planning and guidance to schools and community organizations.